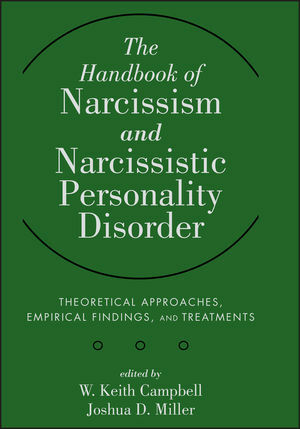 The Handbook of Narcissism and Narcissistic Personality Disorder is the definitive resource for empirically sound information on narcissism for researchers, students, and clinicians at a time when this personality disorder has become a particularly relevant area of interest. This unique work deepens understanding of how narcissistic behavior influences behavior and impedes progress in the worlds of work, relationships, and politics. W. Keith Campbell, Department Head and Professor of Psychology, University of Georgia, is the author of more than 90 scientific journal articles and book chapters, including over 30 on narcissism. He is the author of two books, The Narcissism Epidemic: Living in the Age of Entitlement (Free Press, 2009; with Jean Twenge), and When You Love a Man Who Loves Himself: How to Deal with a One-way Relationship (Sourcebooks, 2005). He has served on the editorial boards for several scholarly journals and his work has appeared in USA Today, Newsweek, Time, The New York Times and The Washington Post. Joshua D. Miller, Associate Professor of Psychology, University of Georgia, has written over 70 scientific journal articles and book chapters, most of which address the topic of personality and personality disorders. He is an associate editor at the Journal of Personality and is on the editorial board of a number of journals focused on personality, psychopathology, and assessment. Kelly C. Cukrowicz, Erin K. Poindexter, and Thomas E. Joiner, Jr.